Classic Black / Gold color combination and simple, traditional design. 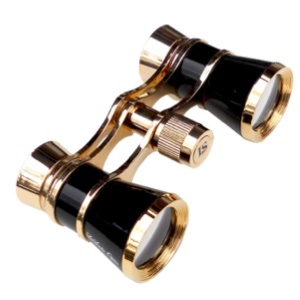 Lightweight and compact, AIDA opera glasses are easy to carry in a small handbag or a purse. The 3x magnification of the bright and clear lenses makes for a very comfortable viewing even under dim lighting conditions. Ÿ__AidaŸ_� combines style and comfort to deliver the ultimate enjoyment of your favorite events.